Gold prices hit their highest in more than seven weeks on Tuesday, boosted by safe-haven buying ahead of a speech in which British Prime Minister Theresa May is expected to discuss plans for a “hard Brexit”. Spot gold had risen 0.8 percent to $1,212.40 per ounce by 0605 GMT, its highest since November 23. U.S. gold futures were up 1.3 percent at $1,211.80 per ounce. “Gold is going to do very well in the first half of the year due to Brexit concerns, Chinese currency pressure and uncertainty surrounding Donald Trump’s policies,” said Richard Xu, fund manager at China’s biggest gold exchange-traded fund, HuaAn Gold. “Stock valuations are pretty high and bonds are not going to perform much better than what they are doing now. There are very few alternatives for liquidity to go to and gold prices will find some support,” Xu added. Britain will not seek a Brexit deal that leaves it “half in, half out” of the European Union, Prime Minister May will say on Tuesday, according to her office, in a speech setting out her 12 priorities for upcoming divorce talks with the bloc. 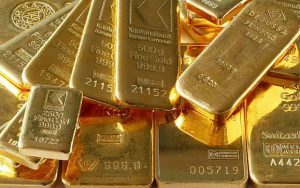 “With more currency uncertainty lying ahead after Prime-Minister’s May speech on Tuesday and with the European Central Bank also meeting on Thursday and likely staying dovish despite pressure on it to tighten, we think gold still has more room to move higher,” said INTL FCStone analyst Edward Meir. A trade war between the United States and China, as well as a strengthening dollar are among the biggest threats to a brightening global economic outlook, according to leading economists at the World Economic Forum in Davos. Trump’s campaign calls for tax cuts and more infrastructure spending have boosted U.S. shares and the dollar, as well as driving a selloff in Treasuries, but his protectionist statements and a flurry of off-the-cuff Tweets have kept many investors from adding to risky positions, instead opting for gold. “We see that $1,250 is not far away, but it is not going to rise above $1,300 as monetary policies are not going to be accommodative for gold prices to appreciate in a much bigger way,” said Xu of HuaAn Gold. Investor interest in gold was indicated as holdings of the largest physically-backed ETF, New York’s SPDR Trust, on Friday rose for the first time since Nov. 9, the day after Trump’s election victory. Spot silver was up 1 percent at $16.94 an ounce on Tuesday. Platinum climbed 0.8 percent to $988.35, while palladium was firm at $744.65.